All for Two Shillings!..Went on then....Goes on now. GODSELL George (61, horsekeeper), and STEVENS, Alfred (41, hawker), both unlawfully uttering counterfeit coin twice on the same day; both feloniously uttering counterfeit coin. Prisoners were tried on the second indictment. HARRY NAPPER , barman, "Oxford Arms," Church Street, Deptford. On January 23 at 11 a.m. Stevens entered the saloon bar, Godsell entering the public bar. Stevens called for a drink, handed me bad florin (produced); I gave him in change one shilling, a sixpence, and four pence. Godsell paid 1d. for a drink. Prisoners remained four or five minutes. I tested the florin, found it bad, and spoke to my father, who is the licensee. Prisoners had then left. WILLIAM GEORGE NAPPER , licensee, "Oxford Arms," corroborated. When prisoners left I went to the door and saw them talking together about 20 yards off. 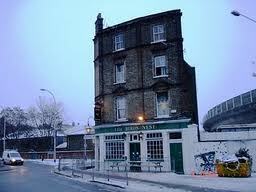 I spoke to the constable, we followed them and saw them enter another public-house, where I spoke to the landlady. They were then given into custody. MARIA HARROLD , wife of George Harrold, licensee, "Plume of Feathers," Deptford Green. On January 23 Godsell came into my public bar, Stevens entering the saloon bar, called for a burton and bitter (2d. ), tendering florin (produced); I gave him one shilling, sixpence, and four pennies in change, and put the florin on the shelf of the till. Shortly afterwards last witness came in and made a communication to me. I then tested the coin and found it bad. I handed it to a detective. Police-constable WILLIAM BALL , 254 R. On January 23 at 11.20 W. G. Napper pointed out prisoners to me in Church Street, Deptford. We followed them. They entered a urinal; then Godsell entered the public bar of the "Plume of Feathers," followed by Napper: Stevens went into the saloon bar. Mrs. Harrold showed me bad florin (produced). I took the prisoners into custody. Godsell said, "I shall go quiet." Stevens said, "All right, I won't give you any trouble." They were searched. Ten shillings, 11 sixpences, and 3s. 4d. in bronze were found on them. Detective ANGUS ROMFORD , R Division. On January 23 at 12.30 p.m. I went to the "Plume of Feathers," where Mrs. Harrold handed me coin (produced). SIDNEY WILLIAM SMITH , Assistant Assayer, H.M. Mint. Two florins (produced) are counterfeit, both made from the same mould. Verdict (both), Guilty. The other indictment was not proceeded with. Godsell confessed to having been convicted at this Court on March 19, 1912, of uttering. Five other convictions, commencing January 13, 1896, for coining offences, including four years' penal servitude, were proved. Stevens confessed to having been convicted at this Court on January 7, 1908, of possession of a mould. Four other convictions of coining, commencing December 12, 1896, were proved. Sentences (each): Five years' penal servitude. Extracts from the records of the Old Bailey. February 1913.